protect.Walker boot is lower leg brace. The product is exclusively to be used for the orthotic fitting of the foot and only on unbroken skin. Open all straps and remove the foam inner shoe from the Walker. foot and lower leg into the inner shoe. Close the shoe and make sure that the foam fits closely against the patient's leg. Make sure that the plastic sleeves over the splints still cover the hook and loop fastener strip on the internal sides of the splints in full. Ask the patient to place their foot in the plastic shell between the two stabilising bars. The foot should be positioned so that both of the splints are centred to the centre line on the side of the leg. The splints can also be straightened for an optimum fitting and to ensure a close alignment on the sides of the calf. Comfort padding can also be fitted on the interior sides of the splints (at the level of the ankle bone). These can be moved or removed to adjust the medial or lateral width between the splint and the foot. If you have made sure that the splints are correctly adjusted and aligned (centre line on the sides of the leg), you can remove the plastic sleeves from the splints. The internal foam shoe is now held in place by the hook and loop fastener strip which is situated on the internal side of the stabilisation splints. Close both of the forefoot straps which hold the patient's foot in place in the inner shoe. The straps should be firmly in place but can also be adjusted individually by the opening and closing of the hook and loop fastener fastener. Any unwanted extra material can also be cut away. Now close the three straps which hold the lower leg in position between the splints. Start with the strap which is nearest to the ankle. The three straps should fit tightly. Ask the patient to walk around in the orthosis to make sure that the Walker is sitting properly. 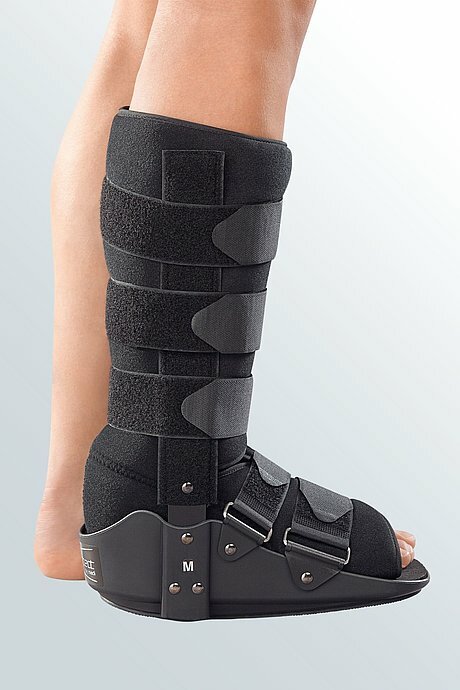 If the patient is allowed to remove the boot during their recovery, or when the boot is removed during a progress check-up, the straps should be released and the hook and loop fastener hook that closes the bootie should be opened to allow the patient to step out of the boot with the bootie still locked in position in the protect.Walker boot shell. This will enable the patient to easily reapply the bootie and boot with the proper leg alignment.